Since their formation in Los Banos California in 2003, the Moonshine Bandits have continued a campaign of crossover genre-bending musical mayhem that appeals to the eclectic, color-outside-the-lines tastes of listeners, aka The Shiners, and they fiercely refuse to have their tastes confined and filed into categories. “Our musical style has always been full throttle and in your face,” says Moonshine Bandit Tex. 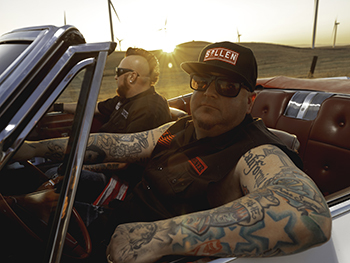 Just like the rumrunners, bootleggers, smugglers, and outlaws of old – the Moonshine Bandits provide a supply of the goods for the demand, defying the mandates and trends of mainstream pop culture. “Our Gold Rush wasn’t always about the glitter because we took the long haul,” Tex says, and just like many of the hopeful dreamers who panned the creeks of the old west’s badlands, the Moonshine Bandits encountered their share of setbacks but never quit. “We got in the trenches,” Tex continues, “learned and got burned.” The group’s Gold Rush reflects on a career that wasn’t about following some set of rules; this is about living by a code. Now with the debut of their own label, the group can fully exercise that code. “There’s a right way, a wrong way, and now there’s our way.” Characterize it as rebellion, call it anti-establishment, or perhaps it’s a little bit of symbolic of an elusive time when there actually was Honor among thieves, but the Bandits simply see it as lessons learned from experience.